Pittsfield Township has three historic farm museums within six miles of each other. This may be the only place in the United States where you can visit three historic farms -- in such close proximity -- which interpret three distinct eras of American agriculture. The farms, and their focuses, are described briefly below. For additional information on these farms, please consult their respective websites. The farms are listed in order of period interpreted, which also corresponds to their north-south position in the township. The farm that interprets the oldest period is the one farthest north; the farm that interprets the most recent time period is the one farthest to the south. Cobblestone Farm is located on Packard Road, in what was the northern portion of Pittsfield Township. The area around the farm was annexed into the city of Ann Arbor, and the farm was acquired by Ann Arbor as a city park. The farmstead is leased to the Cobblestone Farm Association, which has restored the farmstead. This farmstead interprets regional agriculture and farmlife during the 1800-1860 time period. Still located in Pittsfield Township along Textile Road in southwestern Pittsfield Township, this historic farm was in the same family from 1832 -- for almost 170 years. The farmstead was acquired by the Pittsfield Charter Township in 2000, and is leased to the Pittsfield Township Historical Society, which is undertaking the restoration and interpretation of the farmstead. This farmstead interprets regional agriculture and farmlife during the 1850-1900 time period. Located about one mile from Sutherland-Wilson Farm -- along Michigan Avenue just east of Saline, Michigan -- this historic farm was annexed by the city of Saline. The farmstead was purchased by the City of Saline and is leased to the Saline Area Historical Society, which is responsible for programming and interpretation at the Farm. 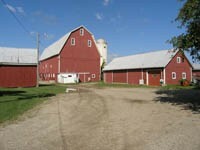 The farmstead interprets regional agriculture and farmlife during the 1900-1950 time period. Also, within a few miles to the north and west of these historic farms, are two equally historic mills. In Saline, old Schuyler Mill (now Weller's), which was built in 1843, is located near the intersection of US-12 and the Saline River. Henry Ford converted this Mill in 1937 to a soybean processing plant for the manufacture of auto paint and auto parts. This mill is on the River Raisin watershed. To the northeast of Cobblestone farm, along the Huran River -- and on the Huran watershed -- is Parker Mill. Built in 1873, Parker Mill is operable and contains original milling machinery, left in the mill when the Parker family ceased operation in 1958.